I've been singing the refrain to this week's 60s tune all week, so I figured why not feature it. 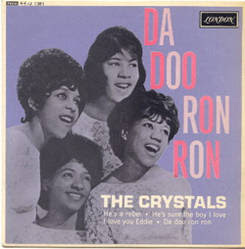 A famous example of the Phil Spector "wall of sound" Da Doo Ron Ron by The Crystals was a 1963 smash hit, reaching #3 on Billbaord's hot 100. The song's been covered by everyone from The Carpenter's to Bob Dylan and a version by teen heart-throb Shaun Cassidy hit #1 in 1977 (hey, there's just no explaining some things). The Crystals, a defining example of the "girl group" movement in popular music, have a fascinating history which includes Spector-produced hits in the early 60s featuring different lead singers. Da Do Ron Ron features Dolores "LaLa" Brooks. A close listen (or look) at the lyrics makes you realize "Da Doo Ron Ron" could well be a euphamism much like Sienfeld's "yadda-yadda-yadda"! I heart him! When I was a kid, I had his face plastered on all 4 walls! I still think the best version of this song was performed by Harold Ramis and his ESL class in "Stripes". Chris: Yep, that's another one.